Quite simply, some of the world's most charming and atmospheric walking. 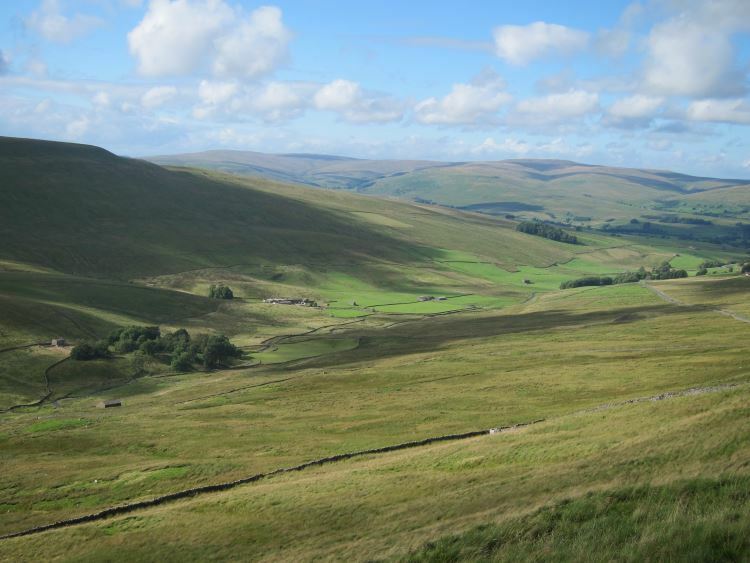 Bleak, grand, wide-viewed moorland tops separated by deep, meltingly pretty valleys (dales). Delightful towns and villages; pretty farmsteads and barns. Long history, diverse wildlife, intriguing limestone geology. Always come prepared for possible bad weather, any time of year. The remarkable and beautiful Yorkshire Dales are in many ways classic limestone landscape - crags, appearing and disappearing streams, dry valleys, sink holes, caves - yet are very different from, and softer than, other famous limestone areas such as the Dolomites. 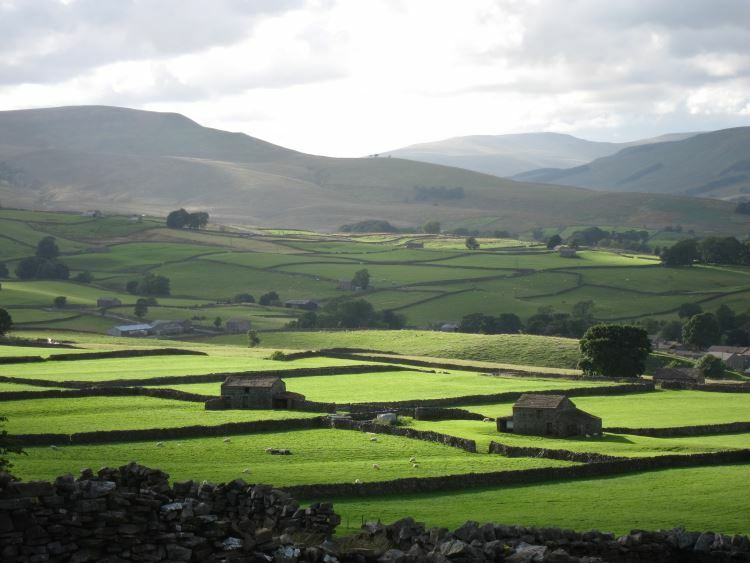 They are characterized by water everywhere, green, green pastures in the valley bottoms and up their sides, divided by drystone walls and peppered with trees, copses, farms and (in some) free-standing stone barns, with crags and cliffs (sills) higher up, and peaty moorland on the flat plateau tops. Glaciation has had a profound effect, helping to chew up the landscape, and leaving the bare pavements and the delightful hummocks and dells that are one of the area's greatest visual delights. The vegetation is rich and very varied here - from the bog and moorland plants of the hilltops to the wildflowers of the valley-bottom meadows. These support a wide selection of insects, which are fodder for a variety of birds. Mammals abound, although you will be lucky to see many beyond the ubiquitous rabbits. 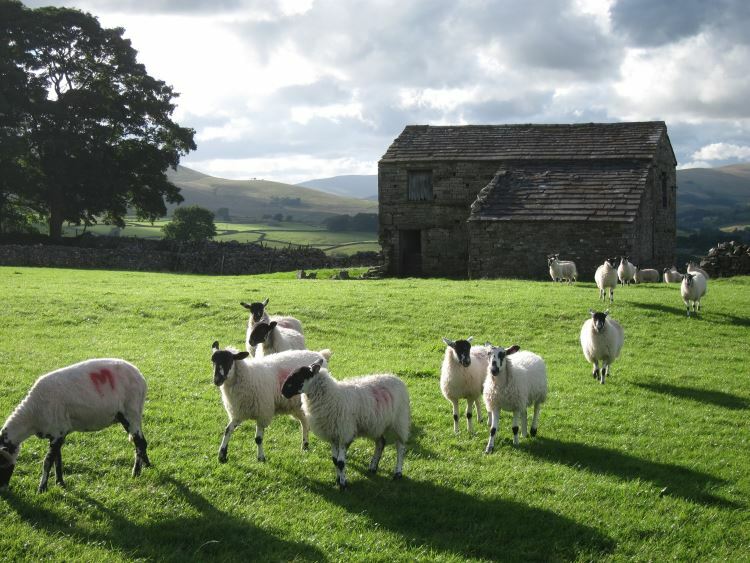 The influence of man on the landscape has been profound and (unless you are a sheep-hating Monbiot fundamentalist) benign, combining with the natural attributes to create the Dales' much-loved idiosyncratic loveliness. The towns and villages are charming and atmospheric, the towns in particular lively if heavily geared to tourism. They are delightful places to stay and eat after a good day's walking. History is rich and varied here, with place names speaking of a heavy Norse influence, and monasteries and great feudal lords leaving their marks (and ruins); the remains of small mines and mills are evident, too, but it is the sheep and cattle farmers who have had the most indelible and profound impact. 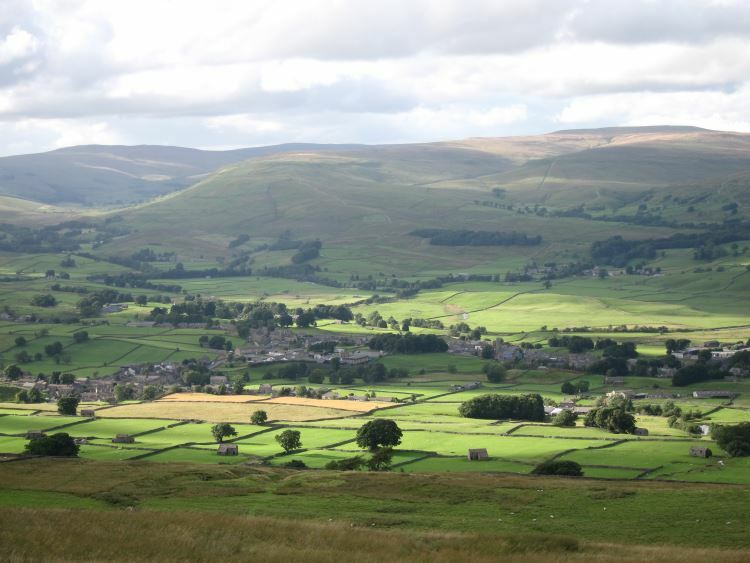 The Dales lie in the heart of northern England, part of the "backbone" Pennine hills and with the Pennine Way running through them. 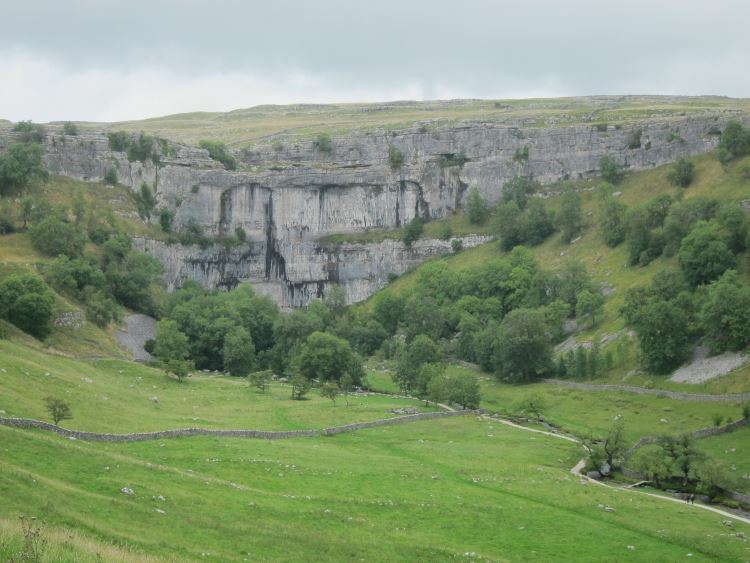 They all have different looks and atmospheres, but one can broadly say that the north-eastern dales differ in character from the south-western ones in that the former are a bit gentler, with stepped, littler cliffs, the latter boasting spectacular features such a Malham Cove and Goredale Scar. The different layers of rock of the north-eastern dales support a particularly wide variety of vegetation. With every dale and hillside likely to harbour some treasure, you could spend much of a lifetime walking here. But, with the outstanding Cicerone guidebooks and numerous other guides and pamphlets, the best walks are well covered. Like the Lake District, you can take any footpath on the excellent maps safe in the knowledge that it is almost impossible not to be delighted. We arrived at Hawes mid-afternoon, with scratchy children, and headed up to the ridgetop Roman Cam High Road on Wether Fell to the south, and had an amazing two hour or so walk back to Hawes. We had never heard of it before (although it turned out that, of course, part of it is, in a different configuration, in the Cicerone), and picked it on 3 minutes' review of the map. And it was an extraordinary walk. That simple. popularity: you will have to accept that the famous walks and places will be overpopulated in high season. To achieve solitude, take lesser-known routes or go out of the high seasons. weather, of which there is lots. While there are periods of glorious sunshine, come prepared for cloud, mist and rain. 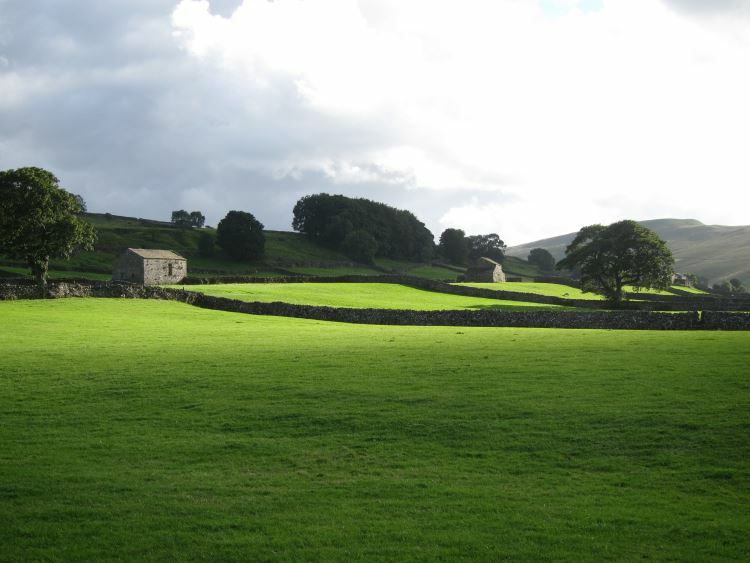 Some of the Dales' most beautiful light is on showery, broken cloudy days. So, how to choose your walking? 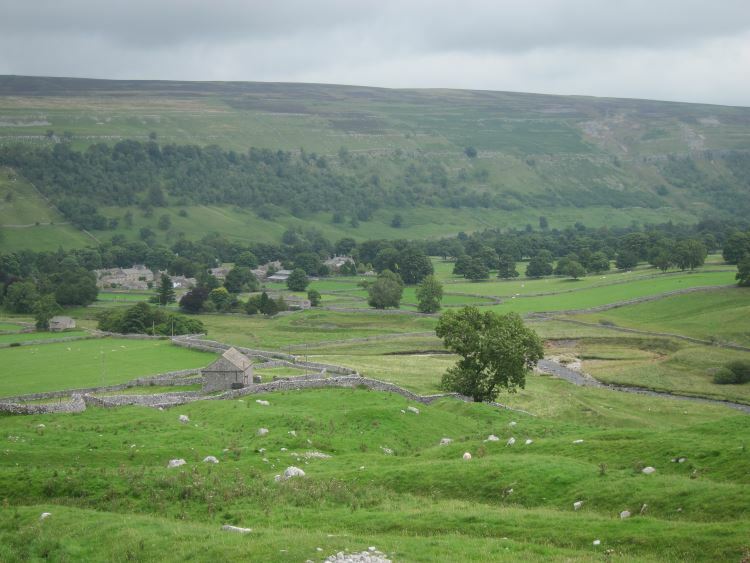 You will want to experience all aspects of the dales, from the huge views and grandeur of the high tops to the gentle beauties of the riverbanks, and - nmissable - the pastures and cliffs of the middle slopes. You have three primary approaches: a continuous walk; move around bagging the very best shorter walks; or finding a perfect place to stay, then delving deep into the surrounding area's possibilities. We will not try to list every possibility, and we are at an early stage of our own Dales eulogy, so we currently list only a small sample of the very best walks. 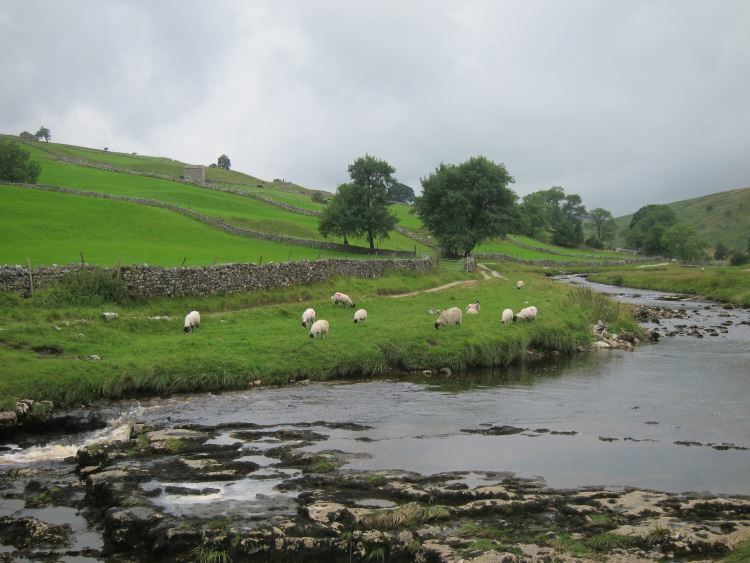 Walking town/pub/hostel to town/pub/hostel is very doable in the Dales, so you can then create all sorts of delightful multi-day walks, perhaps on one of the famous trails, or creating your own circuit or traverse. The latter has the huge advantage that you can plan a route to suit your specific eccentricities, and you can escape the multitudes that walk the famous routes. While there aren't firms that will carry your luggage between stops, you can walk for several days with a reasonable-sized pack. Having extolled your own circuit-creation, there is something grand about tackling on of the famous routes. 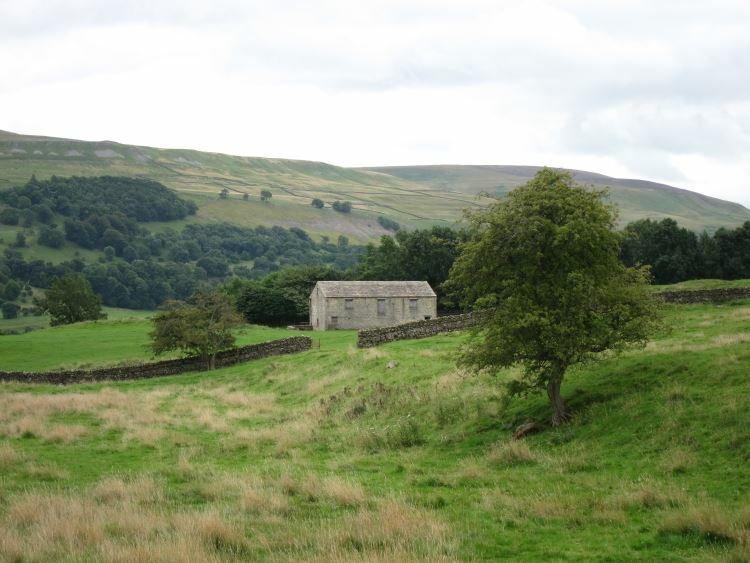 The Coast to Coast: the Yorkshire Dales section of this great walk is a fabulous 3 to 5 day walk, crossing the northern Dales from Kirkby Stephen to Richmond via Keld and Swaledale. We would love to hear your ideas for other wonderful continuous walks. Again, the fundamental Dales problem: where to start? The Cicerone books have a selection of total delights, with a selection such that a browse will give you ideas for whatever type of walk you feel like. The Howgills are geologically different from the rest of the dales, making for steep-sided hills with easy walking on their flattish tops and ridges, after the often sweaty ascents. A classic is the circuit, straight out of Sedbergh, of the Winder, Calders and the Calf hills: it starts with a steep climb, but is then a delightful ridge walk with boasting wide views. The Calf can also be aproached from the east, to include a teeter above the dramatic cliffs of Cautley Crag. Carlin Gill and Fell Head also make a fine, if in places demanding, circuit. Walk up the lovely Rawthey valley, and (if the weather is OK) climb Baugh Fell. Wensleydale: The views up over Wensleydale, with its barns and farms and clumps and patchwork of walls below wild, peaty plateau-highlands, are magical from whichever angle you view them. 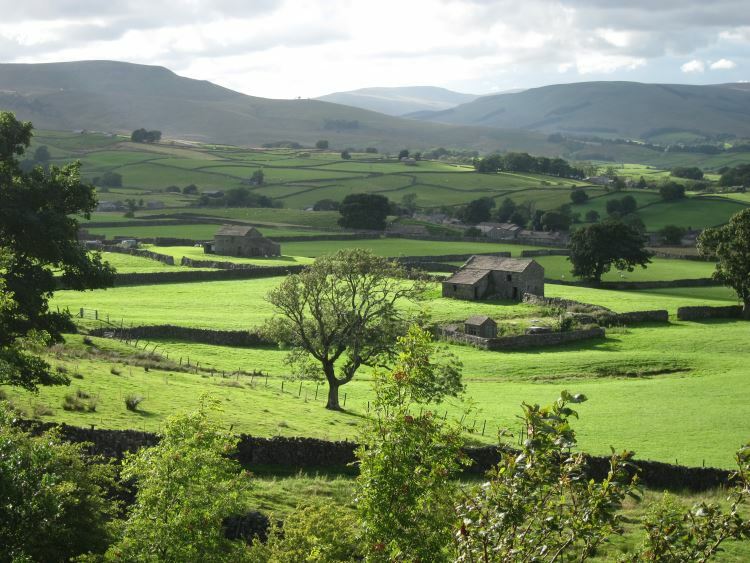 Walks range from higher-level view-fests to meanders in ridiculously pretty Wensleydale itself. The various walks on the uplands around Sleddale to the south of Hawes. 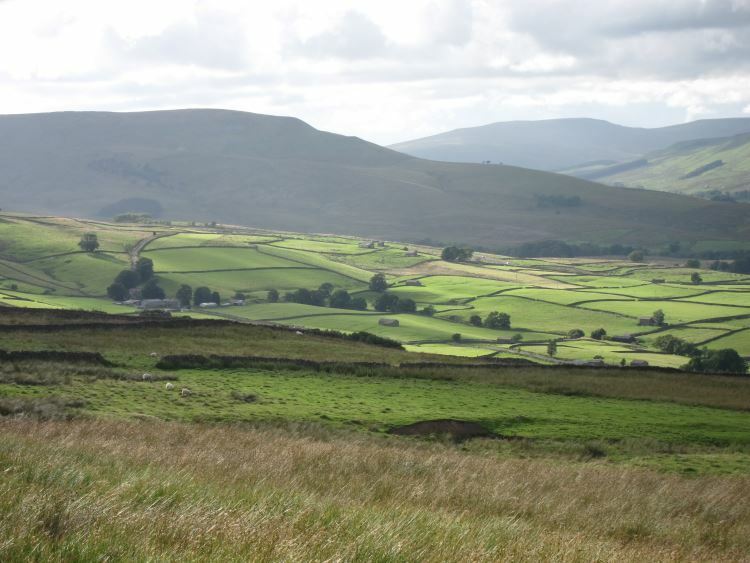 The Pennine Way runs to the west of this lovely valley, and Wether Fell to the east, with the remarkable Cam High Road, a Roman road and subsequently a turnpike, traversing its eastern upper flanks. There are numerous routes you can create, from a horseshoe round the top of Sleddale, to combining an ascent of Wether Fell with a visit to moraine-dammed Semmer Water to its east, one of the Dales' only two natural lakes. 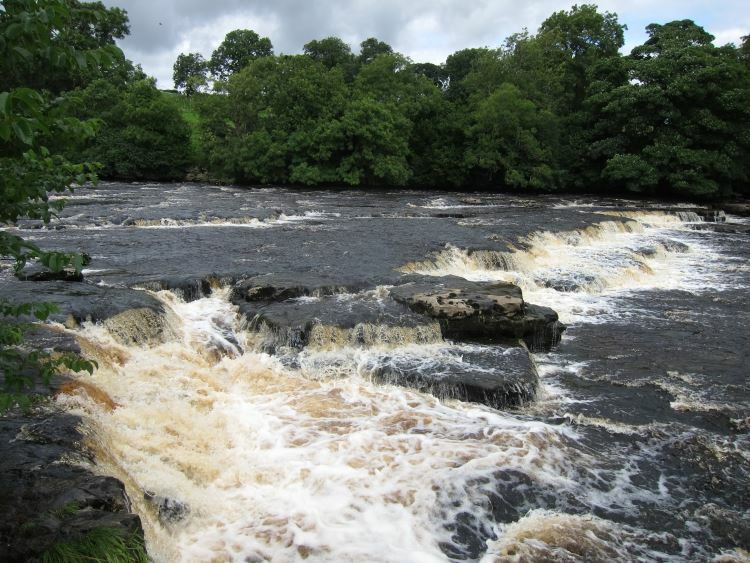 Aysgarth Falls and Bishopsdale: a classic valley-bottom exploration is the swing down the valley from Aysgarth to its eponymous falls, then south down perfect little Bishopsdale, through barn-littered fields to West Burton, then back to the start over a low ridge. Delightful. This western valley running northish from pleasing Settle is perhaps at its best from its peaks and hillsides. As well as the Dales' highest peaks, rising in Ingleborough's case straight from the massif's western escarpment, it has a multitude of exciting and varied walks. As usual, see Cicerone and Wainwright for an excellent selection. Ingleborough: Dales' best-known hill, a proud stand-alone mesa-topped giant rising from the escarpment edge, visible for miles from the west. There are numerous approaches, from the west, south and north-east, with lots of alternatives and combinations available. It is a strenuous slog up the steep upper sides, but one on the main ridge, you have miles of ridge walking between the various hills. 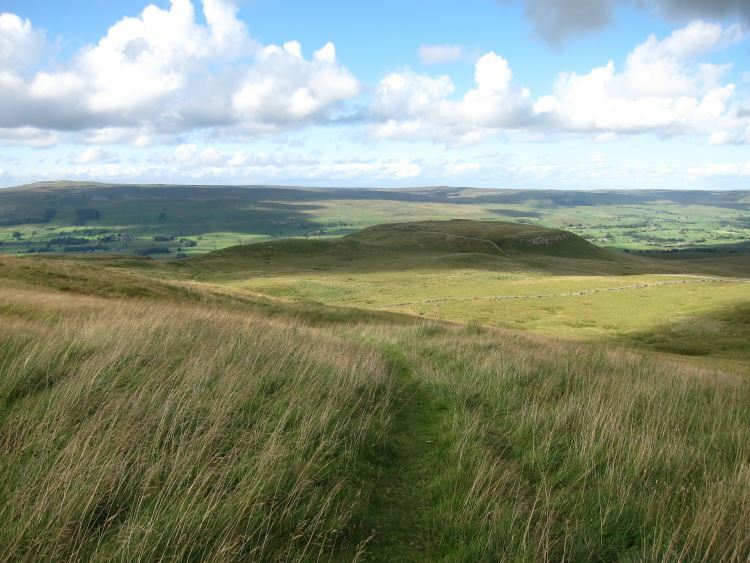 Really glorious all-round views to the sea and lakes to the west and Ribblesdale and Pen-y-Ghent to the east. Take in the famous Ingleborough Cave and deep Gaping Gill if approaching from Clapham. A very popular climb - for good reason, but prepare for crowds on a busy summer day. Pen Y-Ghent: the southern peak a fine lonely flat-topped mesa standing proud to the east of Ribblesdale,A slog up its steep sides is rewarded by fantastic views. Various ways you can approach, most walkers starting from Horton in Ribblesdale. Don't miss stream-swallowing Hunt Pot and huge Hull Pot to the west while at it.Cirecone's route looks particularly appealing. To be written up in detail: recommendations welcome! Whernside: a slog up this lonely hill's steep flanks is rewarded with superb views.To be written up: recommendations welcome! Yorkshire Three Peaks: why is it that people love a label and a challenge? This 23 mile, 12 hr walk is really tough, to an extent that it will cease to be fun, and many (most?) will have their head down and have long stopped enjoying the scenery by the end. But it is an achievement, and bragging rights ensue...Tackle Pen-Y-Ghent, Whernside and Ingleborough, the three great flat-topped mesas of the western Dales, in one big, demanding day. Across Feizor Thwait to Stainforth Force: a good specimen of an easier but fascinating walk: cross the classic limestone upland of Feizor Thwait (think grasslands and limestone pavements), with huge views west and down onto the lovely dry "Happy Valley" below Smearsett Scar. Drop into said valley, turn east and cross a low ridge, first nipping up Smearsett to the north to enjoy further big views. Descend into Ribblesdale. A really satisfying 1.5 hour walk. South-east of Stainforth are Catrigg Force and the delightful hamlets of the Winskills, with wildflower meadows and glacial erratic boulders to admire - as well as meltingly pretty scenery and grand views. Malhamdale and Gordale: This is dramatic country, with cliffs, scars and coves. Malham Cove and Gordale Scar: these over-popular tourist magnets need to be seen, and are better walked as a 7 mile circuit, although this is still heavily walked. Magnificent scenery. 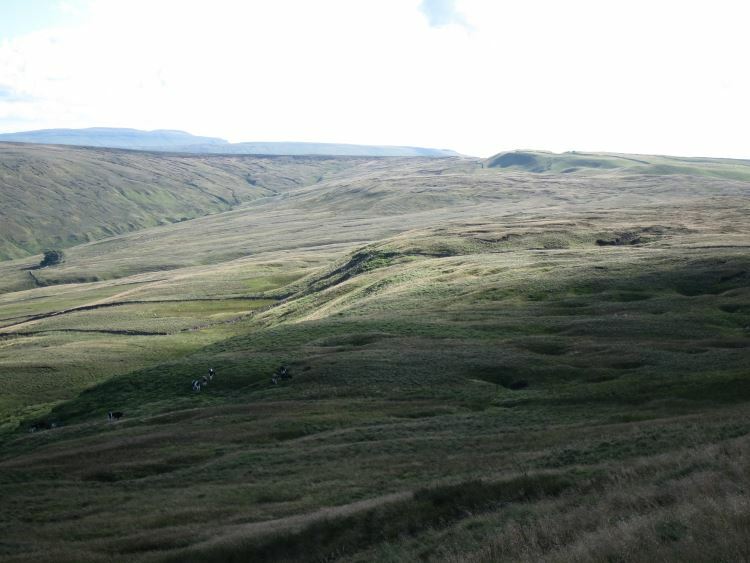 Divert to the Roman camp above Gordale. - the inspiring ascent to and then traverse of the Buckden Pike ridge from Buckden. To be written up in full : recommendations welcome! Nidderdale: the disappearances and reappearances of the river Nidd are a particularly intriguing feature of this dale. The Cicerone guides are particularly nicely written, thoughtful and informative, with excellent introductions dealing with aspects such as the area's geological history, and are hard to fault.